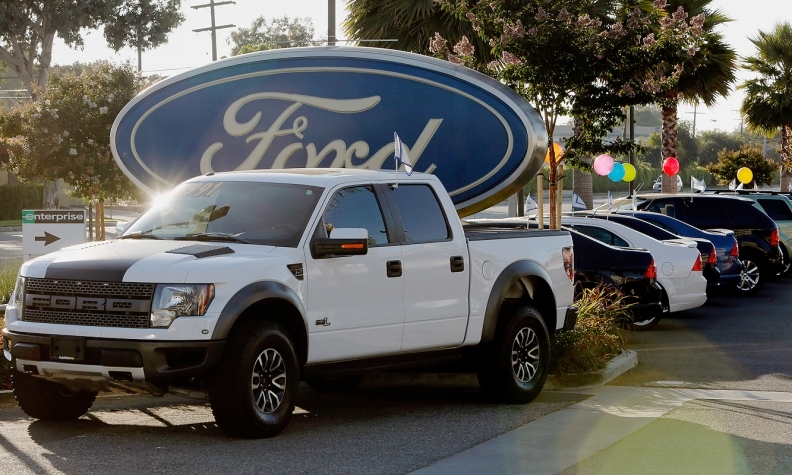 Sales of full-sized pickups jumped 30 percent in July from a year ago to 162,177. With large pickups flying out of dealerships, U.S. auto sales jumped 14 percent to 1.3 million light vehicles in July. The seasonally adjusted annual sales rate of 15.7 million dipped from June but still was above any other month since late 2007, signaling continued strength in the recovery. Kurt McNeil, General Motors' U.S. sales boss, expects the momentum to continue. "With the strength we're seeing in household wealth, consumer sentiment, housing and manufacturing, we think there's definitely more room to grow this year," he said in a media conference call. Six of the seven largest U.S. players posted double-digit sales gains for the month. They were led by a 21 percent increase at American Honda, which pushed the company past Chrysler Group by 1,337 units. With a 17 percent jump, Toyota Motor Sales outsold Ford Motor Co. by 314 units. That marked Toyota's first monthly win over Ford since March 2010. Toyota still trails Ford by 182,000 units through July. No. 1 GM gained 16 percent in July, its biggest percentage increase since January. Ford, Chrysler and Nissan North America all were up 11 percent. The industry's No. 6 player, Hyundai-Kia America, rose 5 percent. That was enough to maintain a narrow lead over Nissan North America for the month and year to date. Volkswagen Group of America increased 2 percent. Growth at the premium Porsche, Audi and Bentley brands offset a 3 percent decline for the VW brand. Big pickups and small cars and crossovers drove July sales, said analyst Jesse Toprak of TrueCar.com. "The big trucks did unseasonably well," he said. "The industry is healthy, stable and growing in all directions." Sales of full-sized pickups jumped 30 percent to 162,177. GM led the parade as the redesigned 2014 Chevy Silverado and GMC Sierra combined with carryover 2013 models to soar 46 percent. Chrysler's Ram pickup gained 31 percent, and the Ford F series was up 23 percent. The Toyota Tundra rose 7 percent, but the Nissan Titan fell 42 percent. The Japanese share of the full-sized pickup segment dropped to less than 7 percent in July, from 9 percent a year earlier. July was also a good month for smaller automakers. Subaru led the Japanese pack with a 43 percent gain, but Mazda also jumped 29 percent and Mitsubishi was up 25 percent. Among Europeans, Jaguar Land Rover was the percentage leader, up 31 percent. Daimler AG rose 19 percent overall and for the Mercedes-Benz brand despite a lesser 10 percent increase for the Smart brand. Two brands increased volume but fell below the 14 percent industry average. BMW group rose 11 percent and Volvo added 3 percent. Ford Motor, Chrysler Group and Nissan North America all boosted July sales 11 percent, a statistical dead heat in Automotive News' practice of rounding gains and losses to the nearest whole percentage point. For numeric purists, rank the trio as Ford (up 11.296 percent), Chrysler (11.114 percent) and Nissan (10.881 percent). How close is that, really? To finish with a higher percentage gain than Ford, Chrysler needed to sell 21 more vehicles. An enthusiast who sees GMC as just a high-margin outlet for Chevrolet points out that in the first seven months Chevy/GMC outsold Ford brand by 247 units: 1,437,856 to 1,437,609, a 0.017 percent spread. Subaru outsold Volkswagen Division in July, 35,994 to 35,779. But with 242,571 sales through seven months, VW is ahead by 1,980 units year to date.